When you need an extra layer of rust prevention on stainless steel, we recommend Rust Rescue 200. In certain environments with salt or chlorine, or if the stainless steel is already corroded, it benefits from an extra layer of chemical protection provided by Rust Rescue 200. 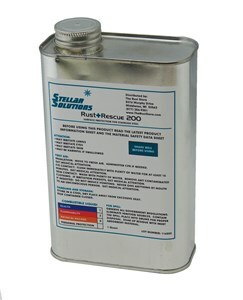 Rust Rescue 200 is formulated to penetrate, even into pits in the steel caused by previous corrosion. For best results, prior to treatment with Rust Rescue 200, the parts to be treated should be thoroughly cleaned with an appropriate cleaning solution to remove dirt, oils, and grease. If thorough cleaning is not possible during use in the field, wipe the surface free of dirt and oils prior to application. All equipment, mixers, applicators or pumps should be clean and dry prior to use. In order for the Rust Rescue 200 to completely penetrate into the pits and scratches in the metal where corrosion starts, the stainless steel must be completely dry before applying. Allow the stainless steel to air dry for at least 2 hours after rinsing. The drying time can be shortened by use of heat, for instance from a hair dryer. Before using, mix the product thoroughly by shaking or stirring. Apply a light coat of Rust Rescue 200 to the surface which is to be protected by using a clean soft cloth, sprayer, brush or roller. Coverage is approximately 800 square feet per gallon. Wait approximately 10 minutes and then wipe off the excess product. Allow the surface to completely air dry. One quart covers approximately 200 square feet. Although very safe in normal use, Rust Rescue 200 is a Calcium sulfonate based material, and as such it may cause irritation to exposed surfaces of the body for some persons. Rubber or plastic gloves should be worn when applying this product to a surface or when wiping it dry. Dispose of according to all federal, state and local regulations. Operating temperature 70-90 degrees F.
Rust Rescue 200 should be stored at temperatures between 50°F and 120°F in steel or approved plastic containers (polyethylene or polypropylene). Q. Do I passivate the stainless steel prior to applying Rust Rescue 200? A. Yes, stainless steel should always be passivated. We recommend using the Citrisurf® line of stainless steel passivation chemicals. Q. Should I remove rust before applying Rust Rescue 200? A. Yes, we recommend Cirtisurf 77 Plus and 2310 for removing rust on stainless steel.